Jones Soda Answers that Burning Holiday Question: What Do Sugar Plums Taste Like? 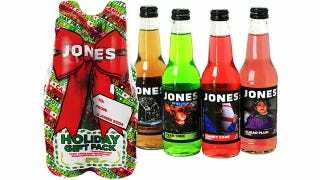 Jones Soda is usually known for their limited edition runs of holiday flavored sodas like tofurkey and gravy, or green bean casserole. But this year they've toned things down with more appealing flavors like Sugar Plum and Ginger Bread. 1) Ginger Bread: made from only the smiley faced heads of 100% organic, free range, gluten free gingerbread people. 2 Sugar Plum: fresh squeezed a la the aforementioned fruit of legend, and plucked from the only known remaining Sugar Plum tree in existence, nestled deep in the Foja Mountains of Indonesia. 3) Candy Cane: a drink so crisp and winter fresh, you'll have no choice but to exclaim "By the beard of Santa!" in a crowded library, and finally 4) Pear Tree: a nectar so refreshing Zeus himself was known to sip it from his silver goblet, whilst wearing headband antlers.